The Mirage Park Resort is a modern hotel located on the beach front with is friendly, relaxing atmosphere within well-kept gardens. The wide range of activities and facilities makes this hotel an ideal choice for guests seeking variety from their holiday. 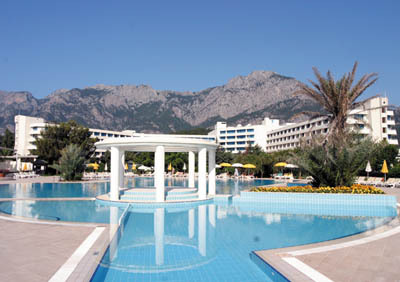 The Mirage Park Resort is situated 2 km away from the Goynuk with a small selection of bars and restaurants. 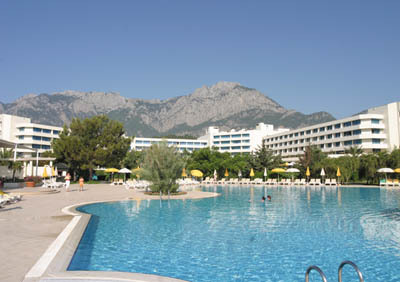 The resort centre Kemer is 8 km away, the airport of Antalya is 40 km away. Reception * lifts * restaurant Olympos * a la carte restaurant Phaselis * 5 bars * disco * 2 outdoor swimming pools (one of them with slides) * indoor swimming pool * children’s swimming pool * mini-club (4-12 years). Fitness * sauna * Turkish bath * 6 tennis courts * table tennis * volleyball * beach volleyball * basketball * mini-football * archery * darts * aerobic * shooting * boccia. Tennis courses, tennis equipments, floodlight, bowling, billiards, Atari, internet, professional football field, water sports, diving school, massage, skin care, imported drinks room service, bottled drinks, fresh fruit juices. Central air-conditioning * safety box (free of charge) * minibar * satellite TV * telephone * balcony/terrace * bathroom (WC + bathtub +hairdryer). Non-smoking rooms and handicapped room also available. 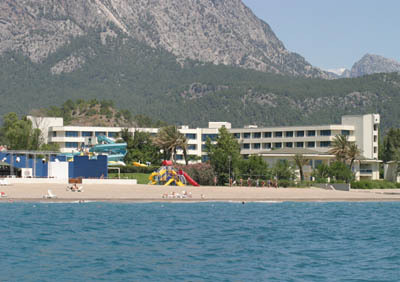 The complex is situated directly on the sandy beach (with pebbles at the shore). Sun beds, umbrellas and mattresses free of charge, beach towels available for a refundable deposit. Unlimited soft and alcoholic local drinks until 02.00. Soft drinks, coffee and tea 24 hours. Open buffet breakfast, lunch and dinner. Late breakfast, midnight snack. In the afternoon snacks, coffee/cake, Turkish pastry gozleme. A la carte restaurants (reservation required) for dinner (Fish, Ottoman).